Back when I was in graduate school, I worked at an outpatient therapy clinic that specialized in traumatic brain injury (TBI). At this clinic, we focused a lot on attention skills. We used cards, worksheets with symbols/letters, the radio, and more to work on various attention activities. 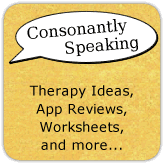 Now, instead of carrying around the decks of cards, worksheets, and radio, you can bring your iPad to therapy! 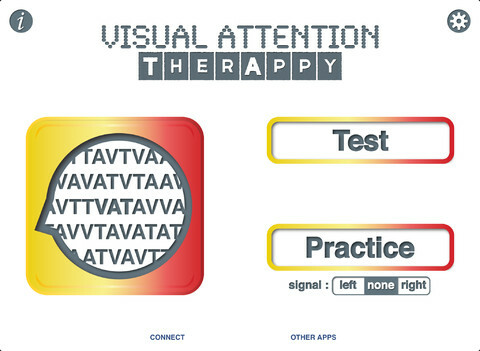 Tactus Therapy Solutions has done it again with their newest application - Visual Attention TherAppy! 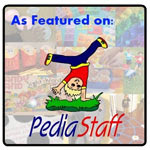 Continue reading to learn more about their latest application. Tactus Therapy Solutions is well-known for creating excellent applications for adults with disabilities including aphasia and TBI. This application is no different. Just like other Tactus Therapy Solutions applications, the application is very clean, easy to learn, and free of distractors. There are multiple buttons on the Main Page. Two are options for application play - Test and Practice. Other options include - Settings, Instructions, Connect, and Other Apps. Pressing the "i" button will bring the user to the Instructions page. This page will discuss the population the application is intended to be used with, how to use the application in the different modes, credits, social media links, a newsletter link, a link to additional apps by Tactus Therapy Solutions, the developer's website, and an e-mail for support/feedback. Pressing this button will open a window with social media links, a link to the newsletter, and a button to review the app in iTunes. This will bring you to the iTunes store to view other Tactus Therapy Solutions apps. Number of Trials at Each Level - Choose between 1-5 or 10 trials. Number of Lines - Choose between the number of lines that will show on the screen between fewest (4), some (5), more (6), and most (8). Spacing - Choose the amount of space between the lines between small, medium, and large. Signal - You can choose for the signal to be red, yellow, or flashing. Default E-mail Address For Results - Type the e-mail for results to be sent to into the blank rectangle. Child-Friendly Mode - Turn this mode on or off via a sliding switch. Turn child-friendly mode if you are using the application with a child. Signal - Choose where the signal will appear between left, none, or right. There are two different modes in which you can use - Test Mode and Practice Mode. Press the level and a checkmark will appear next to the level(s) chosen. You can also press "Select All" or "Deselect All" at the bottom of the page. Next, press the right arrow button. The instructions will appear at the top of the page. A timer will appear on the left and count up for time elapsed. A timer will appear on the left and count up for time elapsed. The trial and total of trials will appear on the right as well as how many items found. The "Done" button at the top of the page can be pressed once a task is done. Once all items are completed, a pop-up window will appear stating the length of time it took to complete the task as well as the percentage correct. If you chose more levels to be completed, press the "Next" button. Once the assessment is complete, a pop up will appear to press "Done". Another pop-up will then appear stating "What's Next" with the options - "Try Again", "E-mail Results", and "Done". Pressing "E-mail Results" will bring up an e-mail with the results for each portion of the assessment in a chart with the title, target(s), time elapsed, number correct, location of missed targets, and wrong targets. There is also a descriptive paragraph stating the time, date, and settings of the visual scanning test at the top. Use this mode when you are practicing attention skills in therapy. Press the "Practice" button and then choose your levels/number of targets to practice. Then, press the right arrow to begin practice. Practice requires the user to follow from left to right starting at the top right hand corner and going down each row. After completing a task, a pop-up will display stating the amount of seconds elapsed, number of targets, and percentage of accuracy. Then, you can press "Done" or "Next". At the top of the application in Practice Mode, it will show the time elapsed, instructions, number of symbols/letters/numbers found, trial number out of total trials, and skip button. Once all of the tasks have been completed, a pop-up window will appear stating "What's Next?" where you can choose to "Try Again", "E-mail Results", or be "Done". The application is clean and free of distractors which allows for the testing to be more accurate as there are only 1-2 things to focus on. Having a visual attention practice application on the iPad is great because one does not have to worry about creating worksheets, printing tasks, wasting paper, or carrying anything but an iPad around for practice. I like that this application has both a test and a practice mode! The fact that you can send a graph report to yourself is helpful for assessing a persons' attention skills. There are so many different settings which is perfect for using the application with multiple clients. Symbols vary based on the level chosen. You can only tap letters, symbols, and numbers from left to right starting at the top row. I would like to see the ability to skip arround via a setting. It would be great if one could save multiple users and their scores to profiles within the application to track data over time. 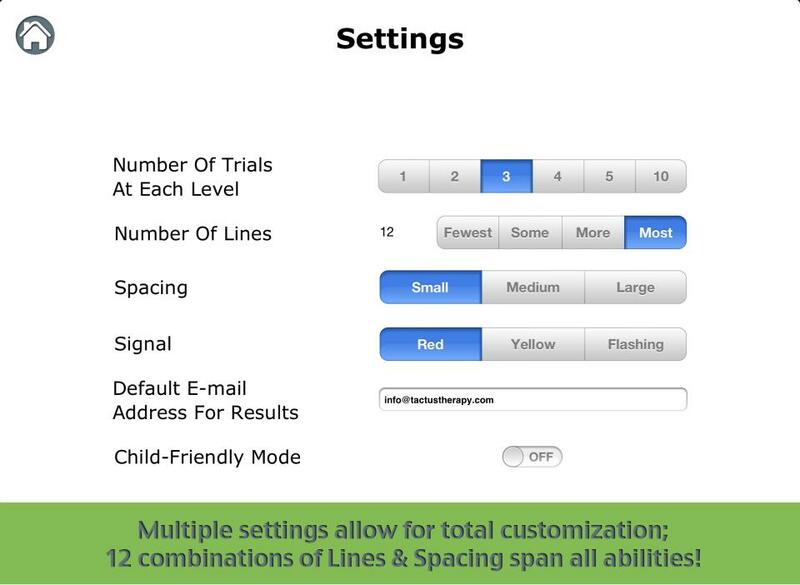 Attention Skills - Work different types of attention with this application by changing the settings, symbol types, amount of symbols, etc. 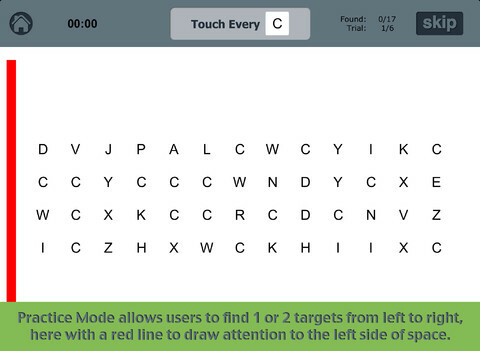 Attention Assessment - Use "Test Mode" to assess a persons' attention skills. Determine which area(s) to focus on via the settings menu. 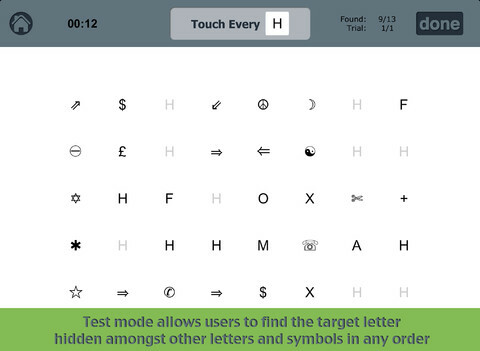 Visual Attention TherAppy is available for $9.99 for the iPad. In addition, there is a Lite version available for free to trial for the iPad.